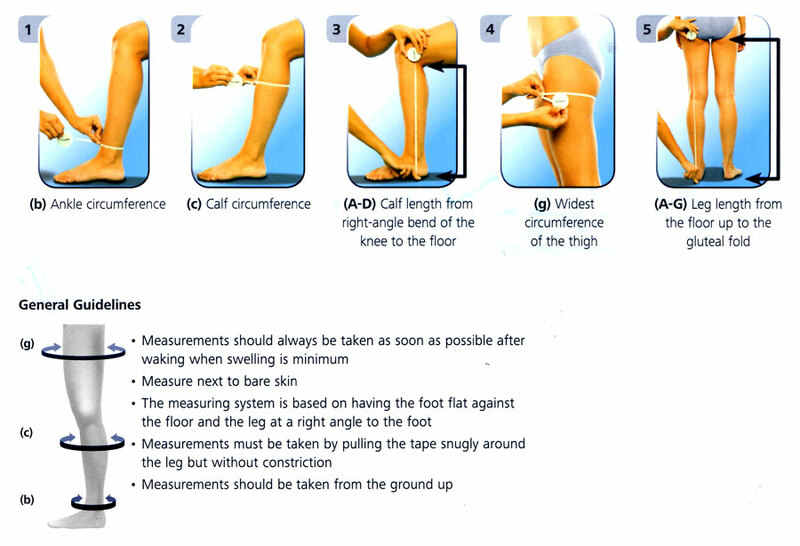 Medical stockings provide a gradual compression, with the ankle being the strongest and decreasing upwards. This reduces the diameters of the veins, reduces the abnormal pressure with venous disorders, as well as, increasing the natural muscle pump action of the leg. Are your compression garments comfortable? Our compression garments are generally not unpleasant at all! If you wear a correctly fitted stocking, the feeling is an immediate relieving effect and your legs will not only look great but feel comforable too. What different types of compression stockings are available? Depending on the type and severity of your disease, your prescription will vary. From transparent, highly elastic stockings with a wide range of fashionable colours, the product range goes all the way to very thick and strong with a seam. How often do I wear my compression stocking? What is the life span of the stockings? Six months if you wear them every day. After that the compression weakens. Many different colours and seasonal colours, open and closed toe garments, latex free and grip top stockings. Does my insurance company pay for these garments? Usually, with a prescription from your physician, these compression garments are covered by your extended health coverage on your medical insurance. Price varies depending on the style, brand and compression of stocking. I have arthritis in my hands and I have a hard time putting them on what can I do? There are accessories to help put the stockings on that are very user friendly that will make it easier and ensure a proper application. Do I need rubber gloves to put them on? Yes without a doubt! Gloves will protect the stockings and disperse the compression evenly throughout the leg. How do I know if I'm measuring swelling properly? Download this guide to learn how to measure swelling correctly. Got more questions? Contact our expert staff for answers.